As I mentioned in the Gitzo GH3382QD Series 3 Center Ball Head review, I first saw the Gitzo Center Ball Head series at the Photo Plus Expo in NYC. These heads immediately caught my attention for a few of reasons. The first was that Gitzo finally embraced the Arca-Swiss standard for the clamps. Second, with a smooth, sculpted triangular design that is nicely finished to match the Gitzo tripods, these heads looked really great. More importantly, these heads were very solidly built and locked down very tightly. I tried the Gitzo GH3382QD soon after the show, took it on a photo trip and liked it so much that I felt compelled to also give the smallest sibling, the Gitzo GH1382TQD Series 1 Traveler Center Ball Head, a try. For a serious ball head, the GH1382TQD is not short, but its overall dimensions are tiny. Let's take a look at the Gitzo GH1382TQD Series 1 Traveler Center Ball Head's measurements and specs. The height of a ball head is an interesting aspect. The lower the height, the closer your camera and lens are to the tripod's apex and all other aspects being equal, that means a stronger and lower-vibration setup overall that is also slightly less-likely to topple over. It also means less vertical space is consumed by the head, an aspect especially welcomed when packing in a case (tripods tend to be long to begin with). But, as the overall head height becomes shorter, the working space on the head becomes compressed and the clamp (and potentially the camera) more-readily impacts other parts of the head, including the ball lock knob. Also, sometimes a slight height addition to the tripod is welcomed, allowing your camera to be positioned slightly higher. Conversely, a taller head means the tripod setup cannot go as low to the ground as when a shorter head is in use. One of the reasons that a head is made taller is because a larger ball and ball housing is desired and more space is required to make that larger size work. A larger ball and ball housing often translate directly into a stronger head with a smoother action. A longer stem on the ball is another reason a head can increase in height. A longer stem can provide more clearance, but the camera on top of the longer stem tilts farther left and right when leveling adjustments are being made (typically a minor detail). If not substantial enough in thickness, the longer stem will allow for more vibration. The size of the ball and ball housing also mandates, at least to some extent, the width of the ball head. 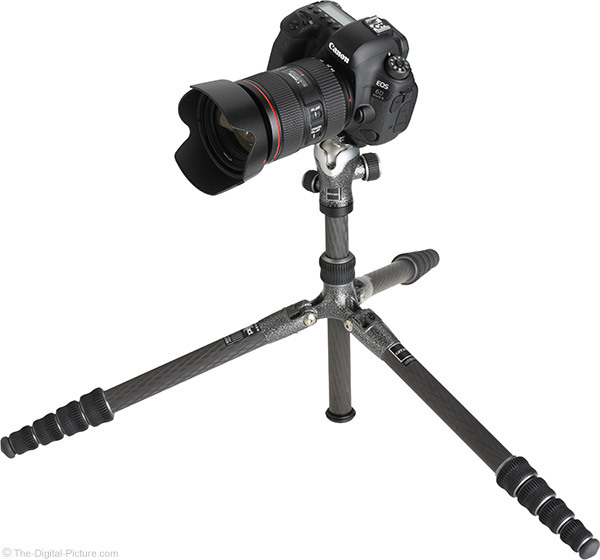 The head diameter becomes especially important when using a "traveler" style tripod that allows the legs to be folded completely back over the head itself with a too-wide head not allowing the legs to fold fully closed. On a standard tripod, I often find the head diameter to be a minor factor in my ball head choice. Putting the height and width together results in an overall size and smaller is easier to pack. Weight is often proportional to the size. Because metals are typically needed for the required strength and rigidity, ball heads are usually very dense with the overall size typically making a noticeable difference in the weight spec. If I'm flying with a tripod, the head usually goes in my carry-on backpack, not only for security reasons, but because I usually need to save the weight in my checked bag and ball heads' size-to-weight ratio usually make them a top choice for this purpose. The Gitzo GH1382TQD is a rather tall head, with its height measuring as much as some of the full-size ball heads. But, it is very narrow, a feature that makes it tiny and proportions it perfectly for use on a traveler-style tripod. 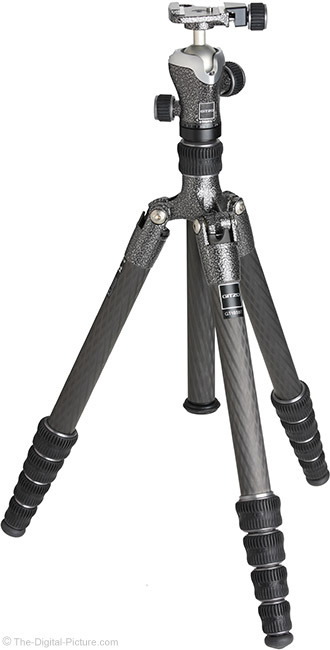 The GH1382TQD is shown above and below mounted to a folded Gitzo GT1555T Traveler Carbon Fiber Tripod, a perfect match. The GH1382TQD's base diameter precisely matches the GT1555T's top plate diameter and the ball head folds up such that the entire setup is tiny. This head's small size translates into light weight and this is one of the lightest ball heads available capable of handle DSLRs and the larger MILCs. The 24.3 lb (11.0kg) load capacity is adequate for even the largest DSLR and lens combinations. With the clamp positioned to just-shy of its 90° limit and the ball lock knob tightened very firmly (I feared breaking it), I put my entire body weight on the off-angle clamp. While the ball was not able to hold my entire 170 lb (77 kg) weight without slipping, it came close to doing so. I had far more weight applied than I would to use on such a tiny head and its matched tripod. Note that exceeding the manufacturer load rating may void the warranty and may cause damage to the head, but in this case, I'm very comfortable with Gitzo's load rating spec. I'll provide more-specific gear capacity advice later in the review, but at this point, hopefully you know if the Gitzo GH1382TQD Series 1 Traveler Center Ball Head is appropriately-sized for your application. Gitzo's model names generally merit explanation and the GH1382TQD model name is ... not the easiest to remember. The first letter, "G", refers to "Gitzo". hat's easy enough. The second character describes the product type and "H" is for "Head" and that's logical. Other letters used in this position include A for Apparel, "B" for Boom, "C" for Carry Solution, "K" for Kit, "M" for Monopod and "T" for Tripod. The first numeric character in the name represents the series number. The higher the series number, the stronger/more-rigid the model. Higher numbers generally come with a higher price tag and a heavier weight. The current range is from 00 (note that one requires two digits) through 5 and the "1" in this case indicates that this is a small, lightweight model. The second number in the model name refers to the material used to construct the legs with "3" indicating Aluminum. 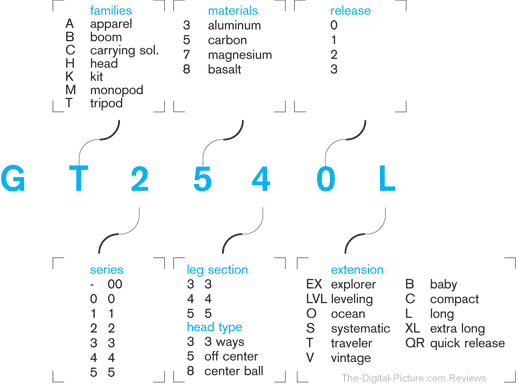 Other Gitzo representations include "5" for carbon fiber, "7" for Magnesium and "8" for Basalt. If this were a tripod or monopod, the third number in the model name indicates the number of leg sections the model has. On a tripod head, the number used in this position has far less intrinsic meaning. The "8" refers to "Center Ball" while a "3" logically refers to a "3-Way" head and a "5" refers to "Off Center". I know, we are all getting lost about now. The fourth number is the release number, incrementing with each model line refresh. The "T" means this is a "Traveler" model. I'll talk more about that soon. The "QD" stands for "Quick Release" for "D Profile" plates. 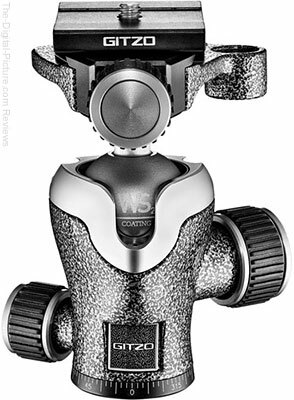 Gitzo used proprietary plates "QR" until recently switching to the Arca-Swiss standard. For many of us, that "D" carries a great deal of meaning. 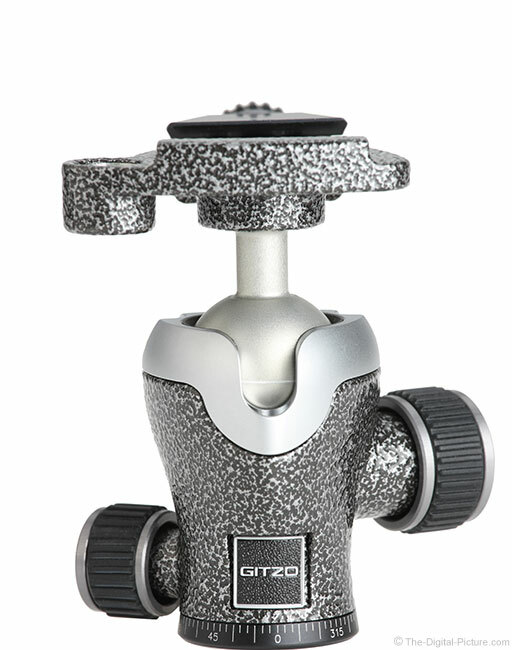 Let's take a closer look at the Gitzo GH1382TQD Series 1 Traveler Center Ball Head. Mouse over (or tap) the numeric labels under the product image to see the different views of this head. The Gitzo Center Ball Heads have a basic design similar to most other ball heads on the market, but they look like no others. 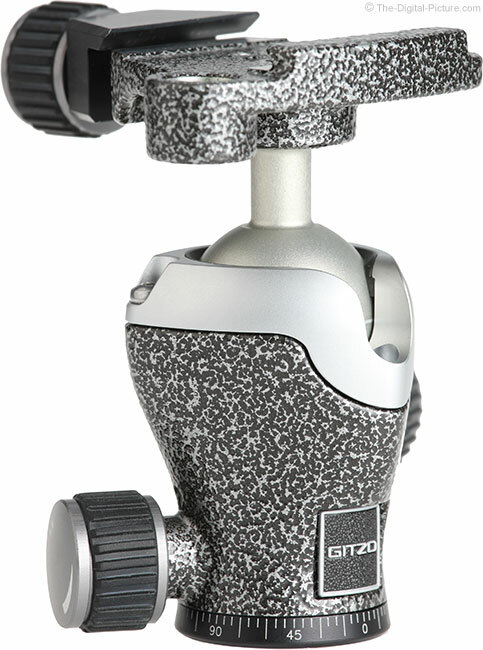 Their curved, tall shape is eye-catching with the durable mottled grey and black finish being very durable and, along with some silver accents, quite attractive, matching the metal parts of Gitzo's tripods. Coated with tungsten disulphide with a graphic indicating such, the ball has a silver color that is slightly warmer than the top collar. The entire head is precisely-made, primarily of aluminum. Ball heads, by definition, must have a ball and something has to hold that ball in place. Call it the body, chassis, etc., but it is a key component and typically the most significant part of a ball head. 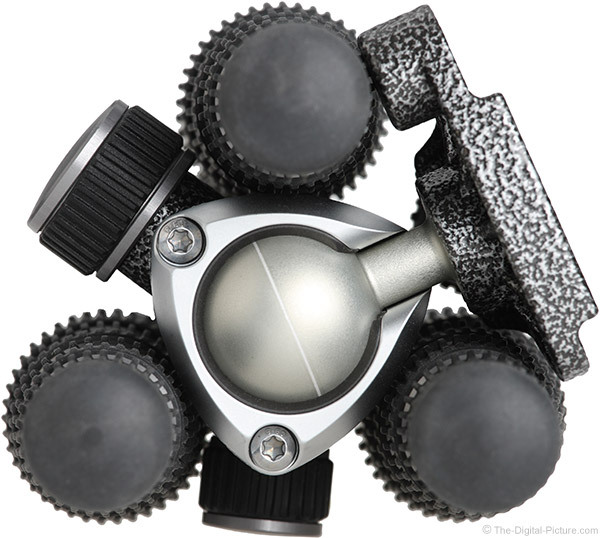 The Gitzo GH1382TQD Ball Head's body is narrow at the base and tapers outward to hold the relatively-small ball. The design is clean, simple and functionally-logical. Three Torx screws are positioned at the top of the body for what appears to be very easy disassembly. The ball lock knob is generally the biggest knob on a ball head and it is probably the ball head feature that you will interact with the most. These knobs are generally rounded or in a lever shape. Levers provide more torque for the space they consume and they tend to have a longer radius than round knobs on a similarly-sized head. Round knobs generally have a smaller radius relative to the body size, but the I find this design easier to roll with fingers. Despite its small size, the Gitzo GH1382TQD gets the round design with a relatively large 1.12" (28.3 mm) diameter. The overall height of this ball head makes the large knob easy to access and clamp impacts are avoided. The knob rolls very easily in fingers and it locks the ball tightly with only a modest amount of torque applied. The Gitzo GH1382TQD's body surrounds the ball with what appears to be Delrin, a dimensionally-stable engineering thermoplastic ideal for high precision parts that require high stiffness and low friction. Delrin provides a smooth surface for the ball to move against and protects the ball stem from metal-on-metal impact at the edge of the body. It is easy to very quickly discern a great deal about a ball head's expected performance using only the ball lock knob. You will find me at trade shows gripping ball head clamps and applying significant torque while tightening the locking knobs. In addition to a bruised palm, this test quickly gives me several key indicators of the head's expected performance. First, the test tells me the amount of main knob torque required to completely lock the ball. Some ball heads require very little pressure applied to the knob and others require very significant amounts of pressure with the ball never becoming completely locked under heavy load (sorry to say that I've even broken a couple of ball lock knobs attempting this). The former is my strong preference and the Gitzo GH1382TQD Series 1 Traveler Center Ball Head performs excellently in that regard. With the help of a relatively large locking knob relative to the size of the head, only a modest amount of force is required to lock the head. Second, and closely-related to the first, the lock knob test tells me the overall strength of the head. As mentioned, some heads never completely lock and are limited to carrying lighter loads (heavier camera setups flop over too easily). To be fair, not all heads are designed for the type of load I'm applying, but with the weight (and cost) of DSLR gear, I'm very cautious about using a head that doesn't lock very tightly. The Gitzo GH1382TQD locks down very tightly with only a modest amount of torque applied to the ball lock knob. The third attribute this test makes clear to me is the smoothness of the ball as it becomes locked. Ideally, the ball will continue to move very smoothly right up until the point where it locks completely, allowing precise adjustments until lock-up occurs. On the other extreme, some balls begins to exhibit a nasty slip-stick action as they become tight. Kinetic friction coefficients are lower than static friction coefficients and when a ball head reaches the point of changeover from kinetic (moving) to static (not moving, locked) friction, the slip-stick phenomenon can occur. The resulting jerky slip-stick motion makes fine-tuning subject framing a bit more challenging. The Gitzo GH1382TQD Series 1 Traveler Center Ball Head exhibits a negligible amount of slip stick behavior when close to locked. One more important lock knob test: Most heads can be locked down tightly, but as they tighten, sometimes the ball moves slightly inside the housing – moving the camera position slightly with it. It is very frustrating to carefully frame a scene only to watch the framing drift as the ball head is tightened. This drives me crazy. I'm using a tripod because I want to lock down perfect subject framing. If I have to guess where that framing will be after the head is tightened, I'm going to quickly get frustrated and the setup process becomes potentially time consuming. There have been some otherwise very nice ball heads on the market that I have avoided because of this issue. When the main lock knob is tightened, the Gitzo GH1382TQD's ball moves between negligibly and just slightly, depending mostly on the lens balance being used. At most, the movement is barely noticeable at 200mm and essentially not noticeable at 100mm. Ball tension control knobs permit the minimum drag/friction level on the ball to be set.] These are a common feature on quality mid and larger-sized ball head models. The Gitzo GH1382TQD is not a mid or larger-sized head an it does not have this feature. The main ball locking knob must be adjusted to provide the desired tension while adjusting the camera position. Because the chassis must contain the ball, the body must extend adequately over the max diameter of the ball. The ball stem coming against the body typically becomes the limiting factor for the clamp's max angle of tilt, a 40° angle for this head. While an L-plate-equipped camera or lens plate-equipped lens often does not need a significant amount of head tilt, a base-plate-only-equipped camera needs to be able to tilt a signficant amount, especially to accommodate vertically oriented image capture. And, even cameras with L-plates sometimes need more range of motion for photographing up or down at strong angles. To accommodate these needs, most ball head bodies include a notch wide enough to permit the ball stem to drop down to a 90° angle, effectively handling any situation encountered. 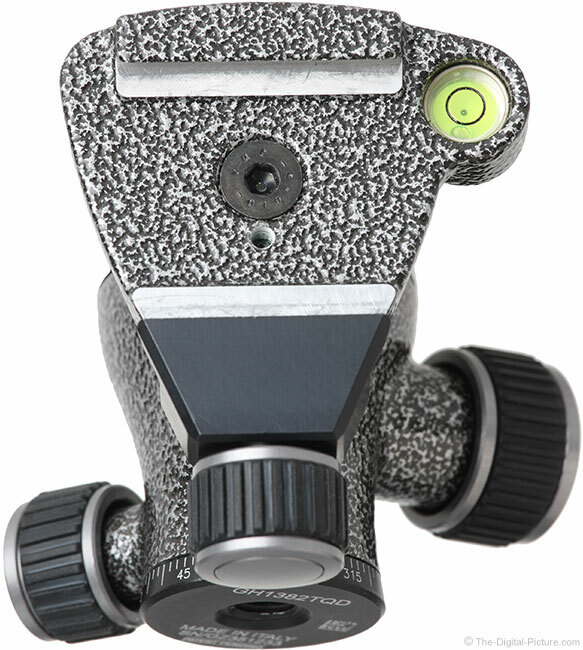 The Gitzo GH1382TQD Series 1 Traveler Center Ball Head has a front-oriented drop notch. This is the normal orientation for this feature and is optimal for shooting downward with the opposite also being true. I seem to need both drop notch orientations with about the same frequency, so I don't generally pay too much attention to the orientation. Most ball heads, including this one, feature a panning base, allowing the head to be rotated independent of the ball adjustment position. Reasons for rotating the base include orienting the ball lock knob for comfortable use, for panorama capture and for simply moving the subject framing side-to-side. Surprisingly is that the panning base's brake feature is often a ball head design weakness, like it was not a primary design consideration. Issues include varying smoothness during rotation and very firm locking knob torque required for complete tightening. You may notice a weakly-locked head when you pick up the tripod with the camera still mounted and gravity causes the camera to swing downward. With the GH1382TQD's narrow 1.4" (35 mm) base, it is easy to get a significant amount of torque applied to the panning base and, while the easy-to-roll 0.88" (22.3 mm) diameter knob does not require a great amount of pressure for reaching reasonable tightness, a firm twist of the knob is required to make it really tight. The smoothness of this panning base is excellent, avoiding slip-stick right up until full lock-up. Did you ever pick up a tripod with the camera mounted and have gravity cause the head to twist loose? Again, due to the torque being applied by gravity pulling on a reasonably-sized camera, it is easy for the head to loosen. It is best to remove the camera before carrying a tripod with this head mounted. Another common feature on the panning base is an index. Indexed bases are most frequently used for precision panorama captures and this head has this feature with marks engraved at 5 degree intervals. The Gitzo GH1382TQD Series 1 Traveler Center Ball Head's thread mount size is 3/8"-16, the (substantial) size most commonly offered by tripods. Ball heads minimally require threads on the ball stem and ideally have a quick release clamp attached for convenient camera mounting. Of very high importance to me is that the ball head clamp (or one that I can mount to the ball stem threads) is compatible with the Arca-Swiss standard and as mentioned at the beginning of the review, this is a feature of Gitzo's latest Center Ball Heads. Components adhering to the Arca-type clamp and plate standard provide quick and solid attachment to each other with plate-equipped cameras and lenses being what is typically attached to a tripod head. The GH1382TQD comes with a screw-knob clamp. While it works great and the knob is easy to roll in the fingers, this clamp is rather slow to use. With the clamp opened just far enough to drop a lens plate into, four finger twists are required to lock the clamp tight. I'd like to see more aggressive threads being used, or even better, a lever-style release incorporated. Clamp size is somewhat of a differentiator. The larger the clamp is, the greater its potential gripping power becomes and the more rigid its construction can be. This clamps is reasonably-sized overall, though the gripping portion is somewhat small, measuring 1.58" (40 mm) on the fixed side and 1.38" (35.1 mm) on the adjustment side. Note that the machined edges of the gripping surface are rather sharp. This clamp does not feature an index, but a spirit level is included. Unless using a very small lens or camera plate (such as the one included), the level will be covered with a camera mounted and it will be difficult to see even with a small plate in use. There is less value in leveling the head prior to mounting a camera and while this feature checks that box, I do not find it very useful. Leveling a clamp within a ball head is always a challenge. Interesting is the white line around the middle of the tungsten disulfide-coated ball. Align it perfectly with the line created by the intersection of the silver and patterned area with in the body opening to quickly center the clamp on the head. This clamp is easily removable via the hex key wrench commonly used for camera and lens plates. Also removable is the safety stop screw. While safety screws are a great idea, this one is not compatible with some non-Gitzo plates. Not all ball heads work well when they are really cold. This head spent a very cold winter night outside along with a handful of additional heads. The temperature had risen to 7° F (-14° C) by the time I brought them in the next morning and aside from the discomfort of the extremely cold head in my bare hands, this one worked flawlessly, just like when it was warm. When cold temperatures are encountered, our exposed skin is usually the first to feel the discomfort and for the hands, that means gloves are in order. Using this head with gloves is not a problem. Generally, ball head manufacturers provide load capacity specs for their heads and expect you to figure out what gear will play nicely together with their respective heads. While that can work, I'm generally not comfortable using with weights approaching max load capacity with vibrations and load manageability being primary issues. To gain my comfort level, I used a Canon EOS 5Ds R mounted to a Canon EF 600mm f/4 L IS II (this combo weighs 12.0 lb / 5.4 kg) and a Canon EF 100-400mm f/4.5-5.6L IS II lens, a 6.3 lb (2.9 kg) load. I used a 3-series tripod to ensure that the head was the limiting factor being observed. The 600mm lens combo is far oversized for the GH1382TQD, but this head held it solidly with no problems, even when nearly fully seated in the drop notch. That is impressive. Less impressive is the length of time it takes for vibrations to settle out (roughly 6-8 seconds). In the wind and on a compact tripod, the vibrations would be continuous and image stabilization along with an adequate shutter speed would be needed for sharp images. The 100-400mm lens combo (similar to a 70-200 f/2.8 combo) represents a more-appropriate max load and the GH1382TQD handles this combination very well. 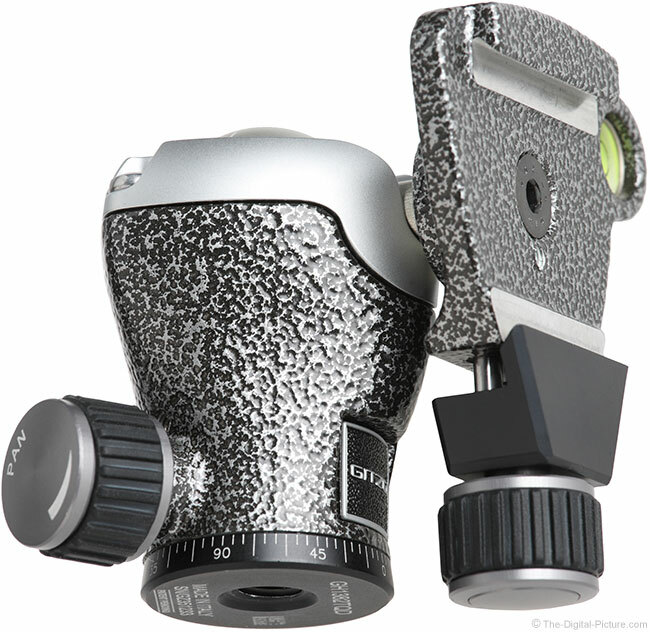 While the lens still seems very large compared to the size of the head, this little head maintains solid control of the load. Strong vibrations at 400mm dissipate in about 2 or 3 seconds. Gitzo is manufactures premium-grade products and these of course bear relatively high price tags. Being a significantly important piece of the kit, I highly recommend buying a quality tripod head and in that light, this one is a good value. Made in Italy, the GH1382TQD should perform perfectly for a very long time. Gitzo provides a limited 2-year warranty extendable to a very-respectable 7-years with registration. 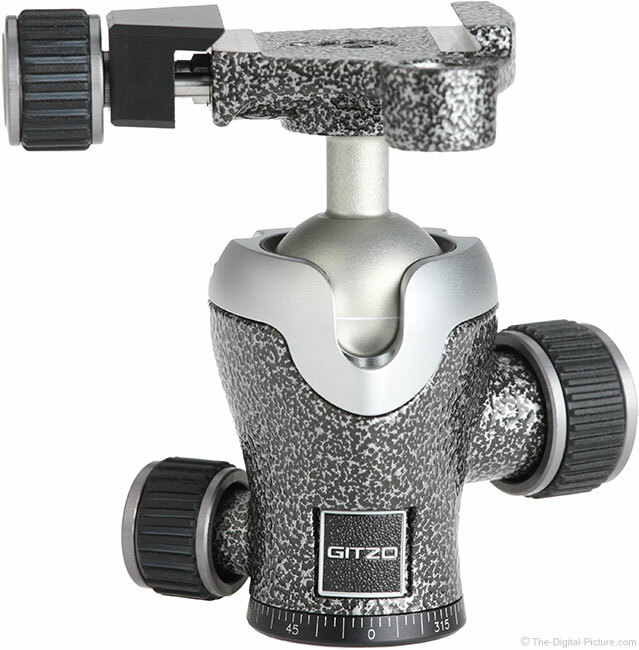 The reviewed Gitzo GH1382TQD Series 1 Traveler Center Ball Head was purchased online/retail. The Really Right Stuff BH-30 Ball Head is the biggest challenger to the Gitzo GH1382TQD. The GH1382TQD is significantly taller and its base is much narrower, permitting traveler-style tripod legs to completely fold over it for an extremely compact overall size. Along with the Gitzo's taller size comes better clamp freedom with clamp self-impact not possible, though the Gitzo does not tilt quite as far (40° vs 45°). The RRS clamp is nicer with the Gitzo clamp being comparably slow to use and rather sharp on the inside edge. The Gitzo ball remains smoother under load and easily locks tight enough for normal use, but much more torque is required to make it really tight and it cannot be locked tightly enough to handle the maximum load that the RRS head can. The RRS shows less vibration with big camera and lens combinations mounted. While the RRS is CNC machined, the Gitzo is primarily cast-molded. 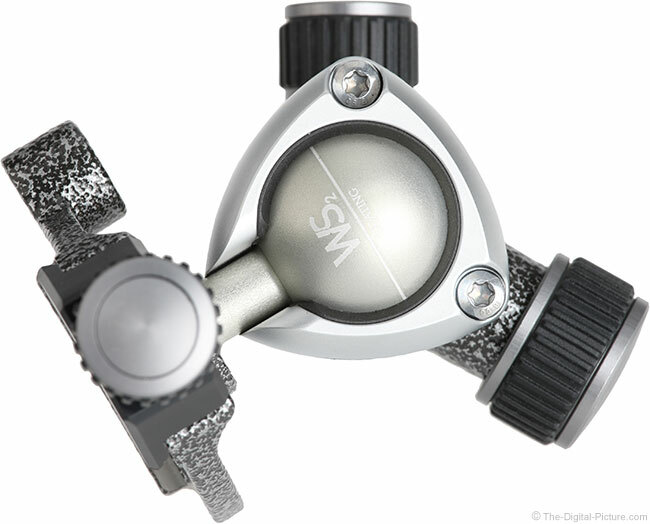 The Gitzo uses ribbed-rubber-coated round knobs while the RRS uses machined shaped knobs and levers. Both function very well and which head has the nicest appearance is up to personal taste. I think they both look great. The Acratech GP-s is another ball head model I currently own and use with some frequency. Thanks to its attractive skeletal design, it is also frequently featured in the site's lens product photos. The Acratech head is larger and very slightly heavier. It tilts to a modestly-stronger angle and includes the tension control knob omitted from the Gitzo GH1382TQD design (the slightly larger Gitzo GH1382QD has that feature). The Gitzo locks tighter, but shows slightly more vibrations. The Acratech GP-s has the better clamp, but it moves the ball noticeably more when locking the ball tightly. The Acratech is considerably more expensive. For those loving the Gitzo design but thinking that the GH1382TQD model is too small, the Gitzo GH1382QD is a great option to consider. The GH1382QD is not too much larger or heavier, but it is a more-capable head. For those needing an even smaller head, the RRS BH-25 is probably the right answer. However, keep in mind that this head is likely going to be found under-sized for DSLRs and larger MILC cameras. It is better-suited for tiny cameras and accessories. The table above compares some of the premium-grade ball head options. For general purpose use, small traveler-sized ball heads are not usually the best option for DSLR and larger MILC models. But, they are invaluable for those times when small and light support is needed. This little ball head is independently great, but it really shines on the Gitzo Traveler 1-series carbon fiber tripods with legs that fold back over the head and the Gitzo GT1555T Traveler Carbon Fiber Tripod is one example of a perfect match. The Gitzo GH1382TQD is beautifully designed and its performance, especially for its tiny design, is equally-beautiful.